Whether fighting for independence or standing for ideals, Americans have always exhibited a revolutionary spirit - a spirit that began here at America’s birthplace! Revolution. Whether fighting for independence or standing for ideals, Americans have always exhibited a revolutionary spirit - a spirit that began here at Americas birthplace! Our Southward journey will bring us to our lodging for the next three nights at the Woodlands Hotel & Suites, located near Williamsburg's Historic Area. 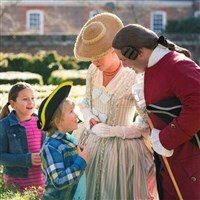 Upon arrival you are free to enjoy Colonial Williamsburg and the remainder of the evening at your leisure. There is a complimentary shuttle available from the Visitor Center to the historic area and Merchant Square. The Historic Triangle Pass is included in the cost of the tour. This gives you the freedom and flexibility to enjoy Colonial Williamsburg, Jamestown and Yorktown for the entire length of your stay. This pass allows access to all daytime programs, museums and exhibition sites. Today you are free to explore Colonial Williamsburg - explore the buildings where revolutionary ideas were born, discussed and disputed. From the imposing Governor's Palace, meant to signal British order and power, to the Capitol, where a successful vote initiated American independence - these brick structures hold the city's past, present and future. See how and where the residents of Williamsburg made a living. From a thriving Public Armory churning out weapons, to the shop of a tailor looking for a new source of fabrics - hear how the economy was affected by the Revolutionary War. This evening is free to enjoy at your leisure. This morning you are free to return to Colonial Williamsburg or relax at your leisure. By late morning, we will depart for home. With stops for lunch and rest, arrival home is scheduled for this evening.